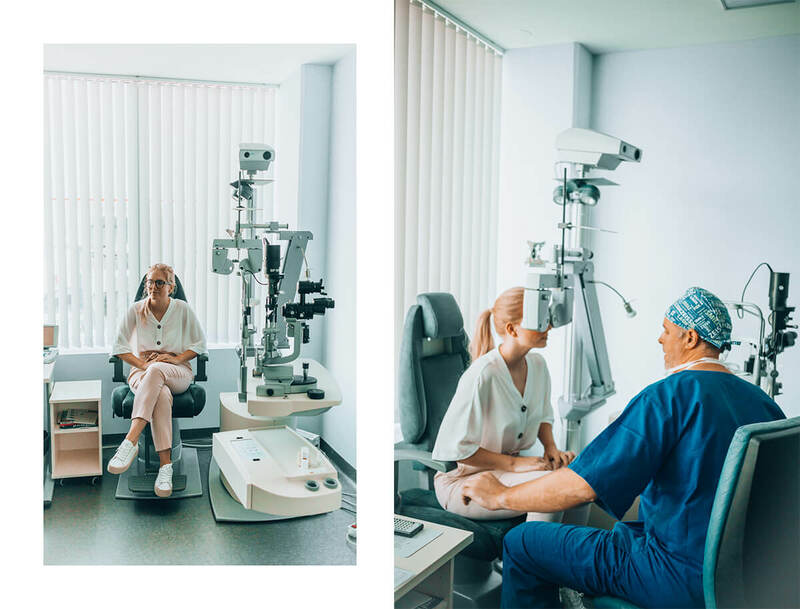 Laser eye surgery – my experience (from -7.00 to 120% eyesight), impressions, fears and how it all happened? 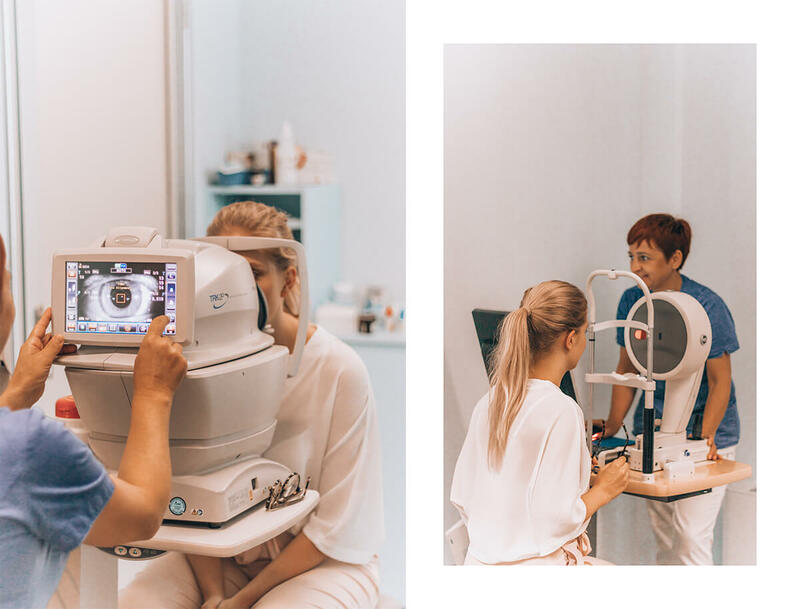 Because the first blog post would be way too long, I decided to split my story about the laser eye surgery into two parts – with this being the second one. 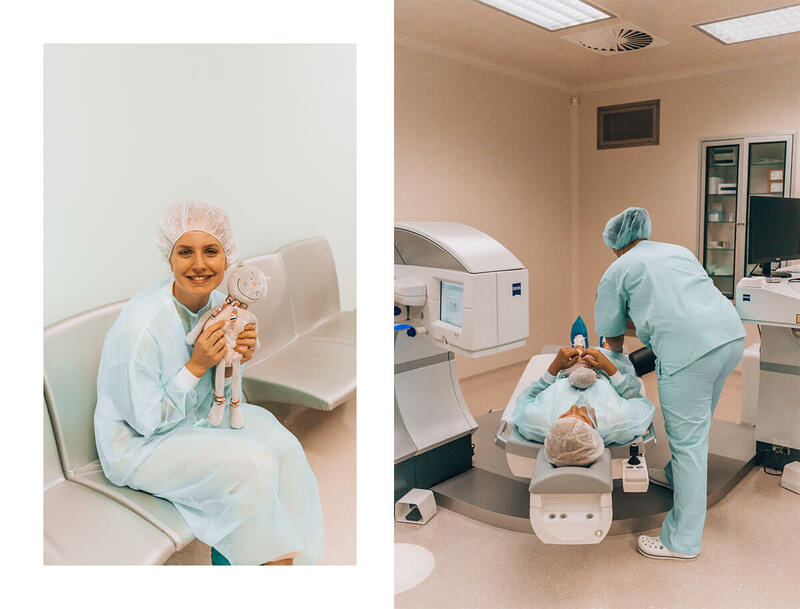 You can read the answers to the most frequent questions before the procedure HERE, while today I am sharing with you everything about my experience, feelings, fears and the whole procedure. 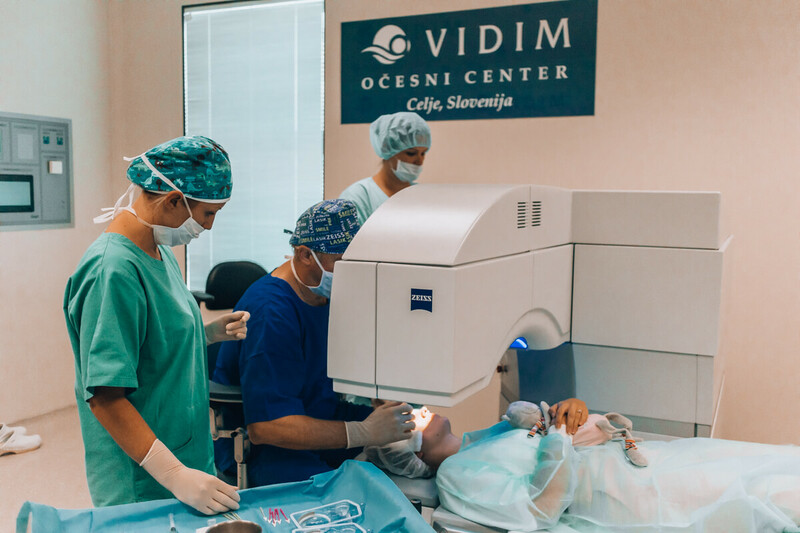 As I’ve mentioned, they’ve carried out a detailed ophthalmological check-up at the VIDIM očesni center in Celje before the surgery and agreed that I am a suitable candidate for ReLEx SMILE method. Approximately a week and a half has passed between the check-up and the surgery (I was operated by Dr. Drev). Before every surgery, they examine some of the things again. The check-up was shorter than the first one. They confirmed my eyes were ready for the surgery and once-again checked my dioptre. Before the surgery, I got a consensus letter on my home address, which I had to read, sign and bring with me. I stopped wearing contact lenses seven days prior to the surgery (I wore only glasses) and was makeup-free on the day of the surgery (Also, I didn’t apply any day cream around the eye-area or put on perfume). Before the surgery, I took two sedation pills (I said some funny lines and was in a very good mood) and approximately half an hour before the staring the procedure, they gave me special eye-drops, which slowly (while incrementally increasing the dosage) numbed my eyes. My main fear prior the surgery was not going blind. There is no possibility of that happening, only with something else going wrong. Statistically speaking the majority of the complications occur because the patient moves during the procedure. And that was the biggest fear of mine. I was afraid that I would feel the need to blink. After all, your eyes are being held open (with the assistance of a special handhold) for approximately three minutes (which sounds a lot, but it passes by quickly). My fears were settled multiple times by Dr. Drev, but the calmest moment for me occurred on the operating table (the eye is so numb, you don’t even think about blinking) when they’ve handed me a pink kitten. The soft toy makes it easier for you to concentrate and forget about the fear. Some would think this method works only for kids, but let me tell you, it worked wonders for me! The procedure itself only takes 20 minutes from start to finish. The ReLEx SMILE method is extremely quick. 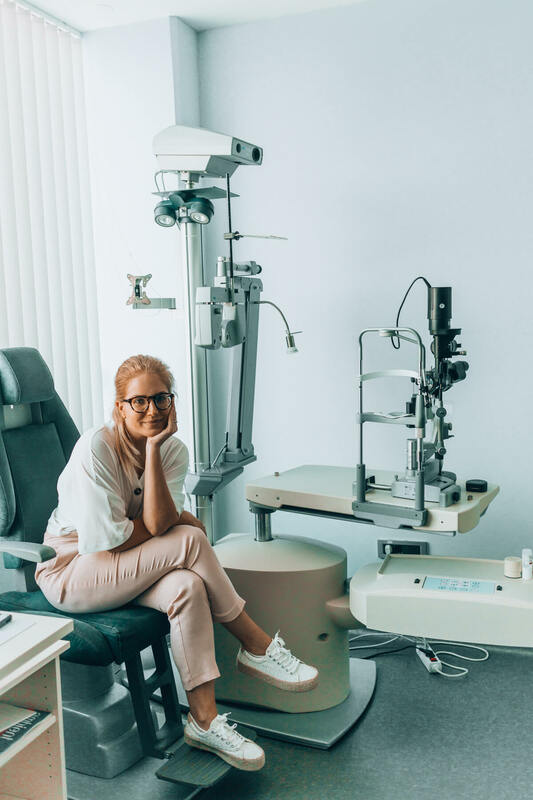 The most important parts are the 25 seconds (per eye), when the laser “is working” and your eye needs to be completely still. 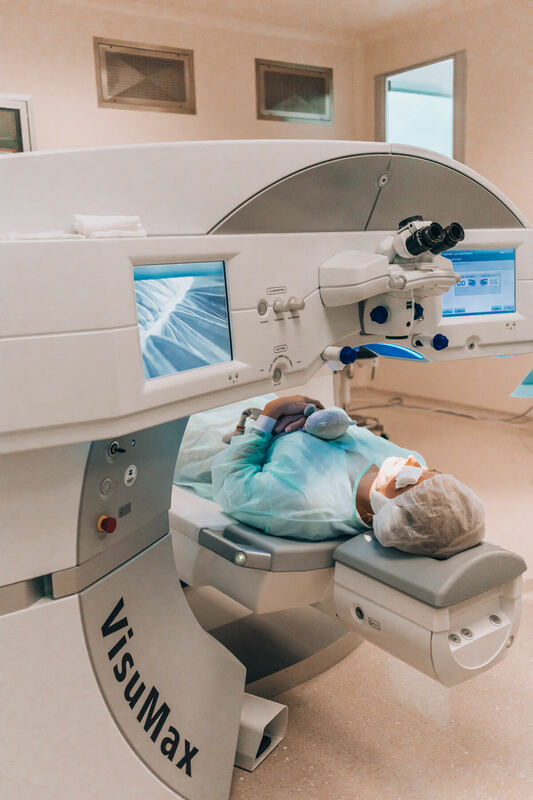 At first you lay on the special surgery table where they settle your head and take you under the laser. Then the laser draws nearer and the most crucial five seconds follow. At that time the laser positions in the middle of the eye and your task is to look straightforward at the green light in the middle. 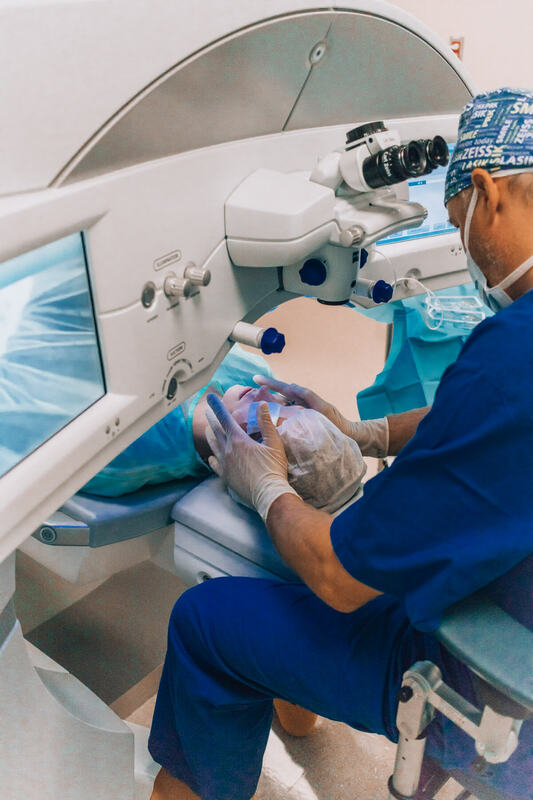 The whole time of the procedure you are led by the surgeon (even though you get detailed instructions already beforehand), so you don’t have to be afraid of forgetting something or doing anything the wrong way. After the five seconds, a special vacuum nozzle is stuck unto your eye (I almost did not feel that and barely knew what was going on) and starts to reshape the cornea. It cuts out the part that needs to leave your eye in order for you to see again without glasses or contact lenses). If you watch the video, it will be way easier for you to understand the whole procedure – I prepared a video on IGTV, made by Jan with a phone). Your job is therefore to look at the green light the first five seconds, afterwards you have to stop following it and just look straightforward. 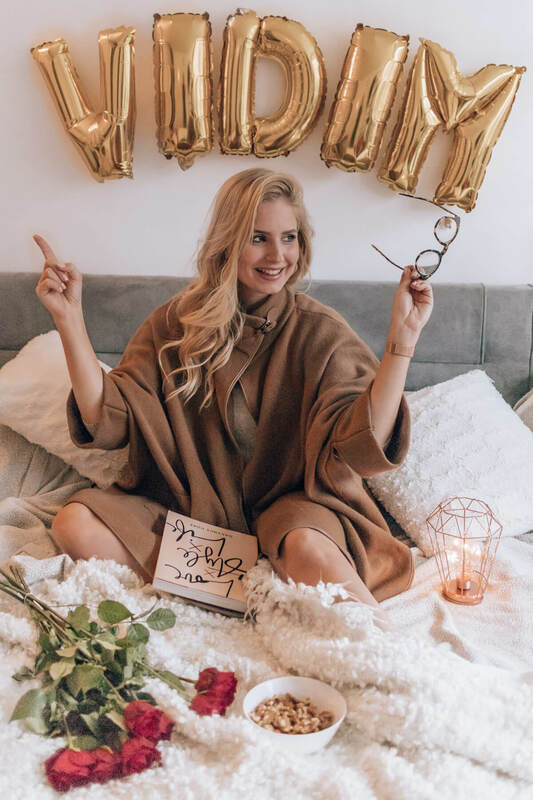 The scariest part for the majority of people follows (you are especially warned about it by the surgeon) – for a moment you see a complete darkness. The surgeon is counting down the time left for the laser to stop working. I was calm the whole time and all of my fears were completely unnecessary. It is a bit unusual to look at the green light for so long and to see a weird, foggy picture at the end, but it’s nothing to worry about. I felt zero pain. 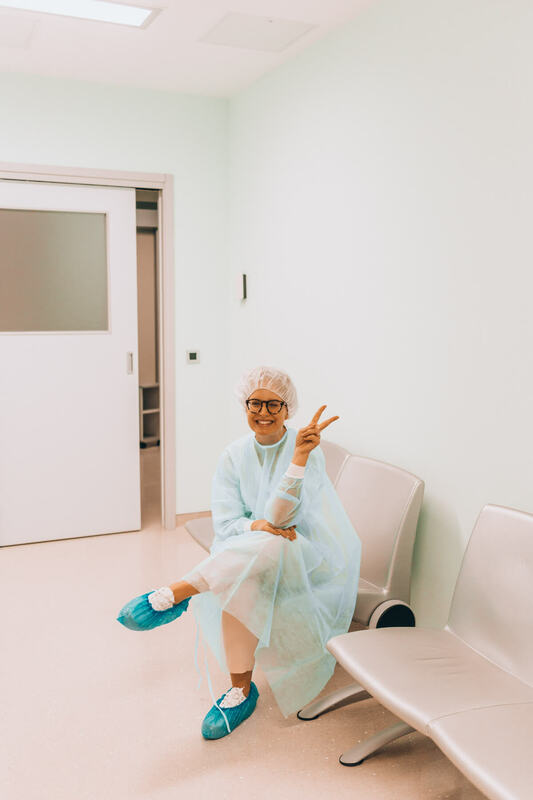 The last part of the surgery was visually the most unappealing, but not as much for me (as the patient you don’t see it, which unfortunately doesn’t apply to everyone else in the surgery room) – Jan and Vanesa said that it looked scary, as if they were watching a scene from a sci-fi movie). 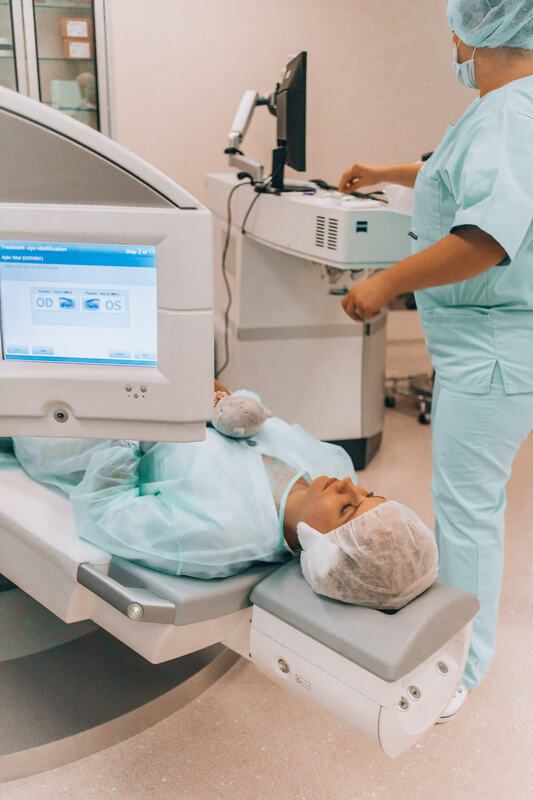 The procedure is performed through a tiny incision (specific for the ReLEx SMILE method; you can read about the differences with other laser surgeries in my previous blog post) where the surgeon takes out some tissue from the cornea. You see this part as if someone was poking your eye (the picture is quite foggy), but it’s not uncomfortable. I was honestly more scared of the first part – if I was able to sit still long enough, the second part was a piece of cake. So the stuffed kitten didn’t suffer either (I wasn’t squeezing it too much). 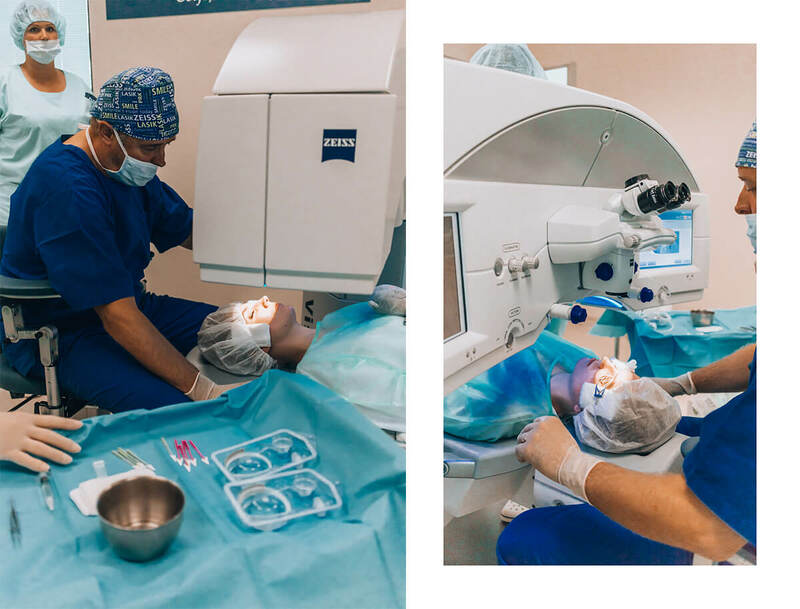 The first part of the surgery was therefore completely under the control of an incredibly precise laser and the second part was in the hands of the surgeon. The second part takes around two minutes, sometimes even less. At the end, the surgeon presses the cornea back unto the eye, your sight fogs up, but they cover your eye. The next eye follows with the identical procedure. The whole thing (if everything runs smoothly) lasts for about 15 minutes. By the end of the surgery, they remove the temporary sticker on your eye and you already see much better. At least I did. From -7.00 dioptre (and a cylinder), I saw the clock’s minute hands, positioned three meters away. I immediately got the eye drops and a check-up in one hour. In the meantime I, Vanesa and Jan went to grab a lunch in the nearby shopping centre. I had sunglasses to protect my eyes and had to put eye-drops into my eye every 15 minutes. But I was already walking on the streets of Celje after a few minutes! I didn’t see the best that I could, but better than before the surgery without the glasses. Everything turned out great, Jan was driving us back home, while I already saw much better. “Side effects” and impressions after the surgery – I swear it doesn’t hurt at all! On Friday, I had to take special care of my eyes and I had to periodically use eye-drops (something I never liked to do). My eyes were s a bit irritated, but it didn’t hurt at all. As I’ve mentioned, I the doctor gave me detailed instructions and products for eye care. I got special eye drops for special cases (if I were in pain), which I didn’t use (as they’ve said nobody with ReLEx SMILE method used them, they give them to you “just in case”). I also got Dexamo antibiotic drops, Tobrex drops, artificial tears for dry eyes (Thealoz Duo) and a special gel for eye moisture (Recugel). I used all of these products by the doctor’s instructions. For the first three days, I used them once every hour and gradually less seven days after the surgery. Side effects? Some of the shining, tired eyes for a few days and the red right eye (not because of the eye laser surgery itself, but because of the grip with the tweezer, which fixes the eye – nothing unusual). Around 14 days after the surgery everything was forgotten! Aaaand …. When did I finally see perfectly? The next morning I already saw almost everything – subtitles on the TV, road signs and similar things. I have to say, everything was slightly bright and glaring. The brightness/shinning completely disappeared throughout the next few days. 2 weeks after the surgery) the only shining I experienced was when looking at some small lights in the dark, when my eyes are already very tired. The eyesight was very good already after one day, but it got to an excellent condition after three days. My eyes were craving some eye drops the first few days and were a bit more irritated in the morning (because they didn’t get their “dosage” during the night). I got called by a very kind nurse every day after the surgery to check my condition and remind me how to use the eye drops. The whole experience was amazing, completely painless and my life changed over the night. 120-times better! I am sure you’ve already heard that after the eye laser surgery you can’t use your computer and you need to lay in the dark for a few days. Well, with the ReLEx SMILE method this does NOT apply. On the surgery day, resting in a darker space is recommended. You also have to avoid unclean spaces and hands, cooking, steam and eye rubbing. Two to three days after the surgery, you have to protect your eyes from the sun, but you can already watch television and use your computer – as much as your eyes “allow” you to (you listen to your body as much as you can – the usage is therefore NOT forbidden). 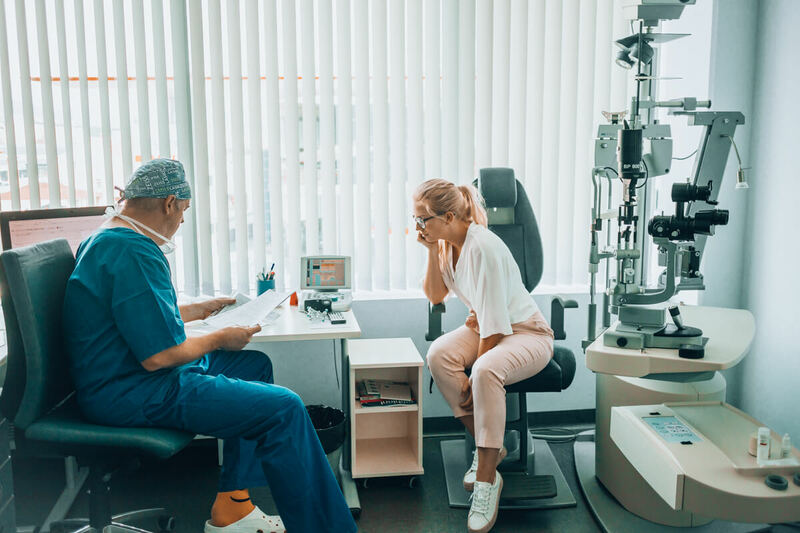 You have to be extra careful not to let shampoo or soap into your eyes and have to be watch out when playing with children (this and contact sports are not advised). You can already use cosmetics, but no eyeshadows, pencils or mascaras (no makeup around the eyes). The first week after the surgery, the appliance of makeup and some lighter sports activities are allowed. After one month, there are no limitations. Of course, it depends on the individual, how fast the eye heals, something they find out during the check-up. 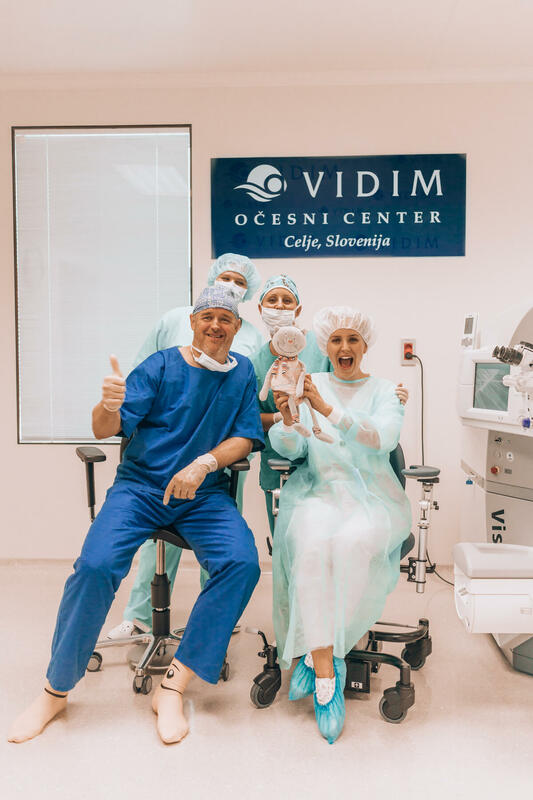 The VIDIM očesni center only carries out surgeries in Celje, with their check-up doctor’s office also in Ljubljana, where I went to get a checked-up by the Dr. Tomec. He concluded that the healing of my eye was great and my eyesight is 120% better! The next (and probably the last) appointment will be in October, one month after the surgery. I can see without prescription glasses or contact lenses! The experience was truly positive and remarkable! I still can’t grasp that I can see everything! Even the things I couldn’t see with the help of lenses. 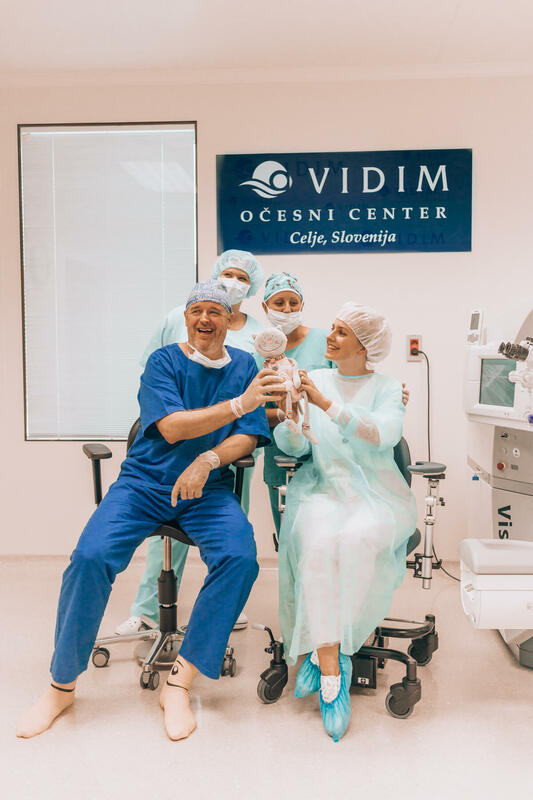 I have to conclude this long post with a “big thank you” to the whole VIDIM očesni center team – at least 120 times thank you! You are incredible and have truly turned my life around. I can’t praise you enough!